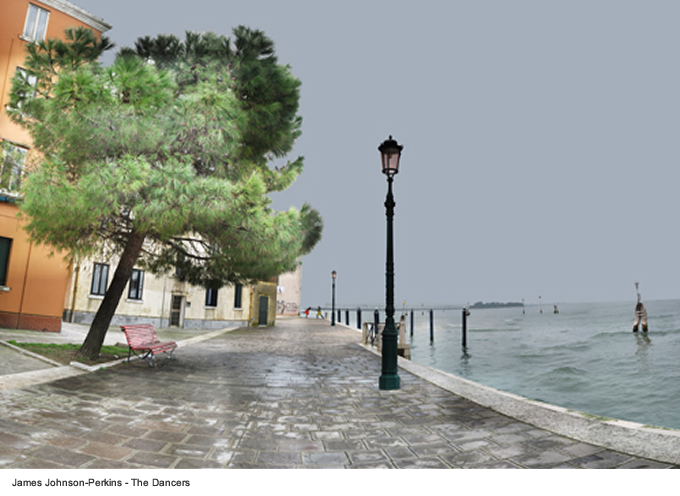 For inspiration among the narrow streets of Venice, James Johnson-Perkins, conceptual artist who teaches at Newcastle (UK), stopped to tell readers Digimag of his residence for artists in Venice, a few weeks of immersion in the suggestion of the lagoon town, thanks to a scholarship from the Emily Harvey Foundation. 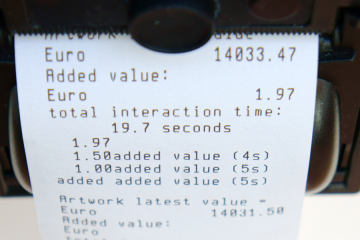 The conversation with British video artist offers us some interesting ideas regarding possibilities for video-makers and artists in general Gigapan technology. 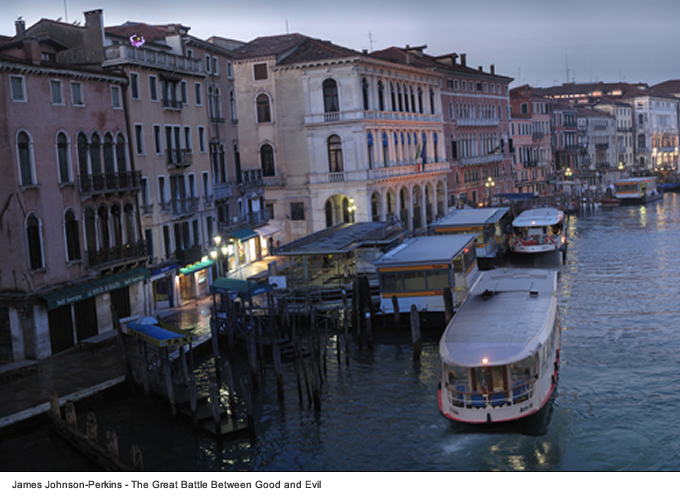 Johnson-Perkins’ recent experiments with this technology (www.gigapan.org), all accompanied with a Pop sensibility, can reinvent the tradition of Renaissance Venetian views. Active in the artistic research at the crossroad of video-making, performance and animation, the Newcastle-based artist has exhibited his work in major art spaces in the United States, Russia, Japan, Germany, Spain, Romania, Lithuania and the UK, including the IMAC Theatre in New York, the National Centre for Contemporary Arts (NCCA) in Moscow, the Toyota Museum of Modern Art in Japan, the Centre for Contemporary Art (CCA) in Glasgow and The Royal College of Art in London. 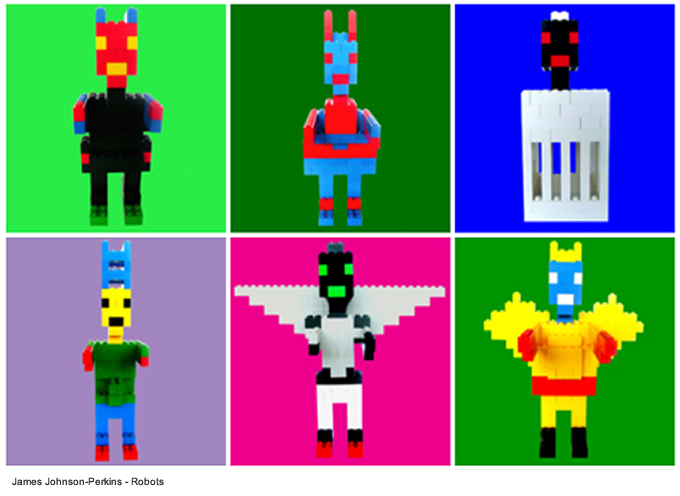 Johnson-Perkins employs Lego models in his robot-like sculptures as well as in his 2-D mega paintings. 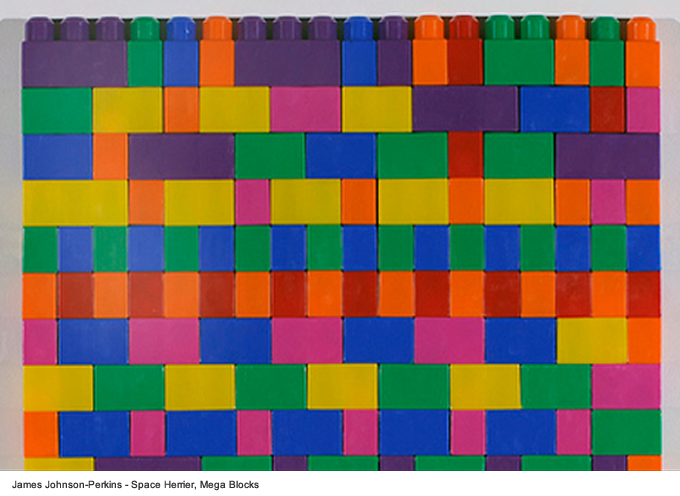 The bright colours of the Lego pieces create the geometrical forms of the conceptual animation series Jet Pack (2007) or Space Invader (2007), where the exploration of the surface texture reveals its roots in optical art and a mastery of colours and geometries à la Sean Scully. The repetitive movements of the robot-performances and the geometrical patterns return in the rhythm of Perkins’ sound-based videos such as How does it feel? (2007) using the soundtrack We are the robots, played in 1977 by Kraftwerk, the pioneers of electronic music. Silvia Casini: So, let’s start our conversation. First of all, how did you come to Venice? James Johnson-Perkins: I’m here thanks to the Emily Harvey Foundation, an American foundation that promotes and supports residencies for artists and curators. 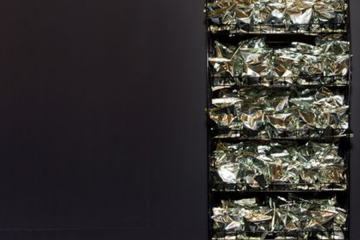 The Emily Harvey has very close connections with the Fluxus movement in New York, many artists have been inspired from that ’70s art movement. 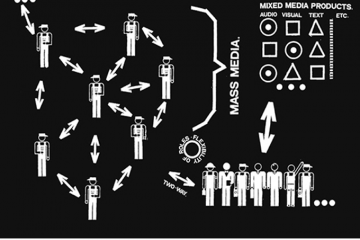 When I submitted my application for a scholarship I worked with Alan Bowman, a representative of the new generation of Fluxus artists and I would say that my work presents some similarities with Fluxus. Silvia Casini: What was your goal when you asked for an artist-in-residence in Venice? What type of project did you present to the Emily Harvey Foundation? well, it is rather difficult to answer. I think I wanted to do something similar to what I had done before, but using Venice to draw new blood, new inspiration. James Johnson-Perkins: All the work I have done over the past five years looked back to the eighties and to my relationship to it as I grew up in that period. 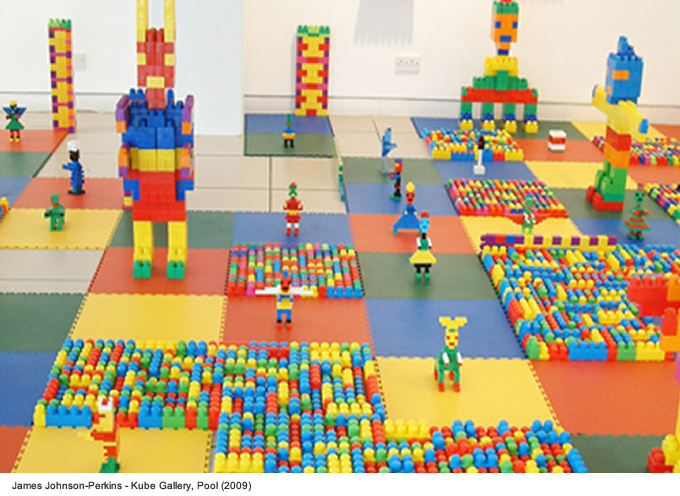 I used materials and objects that come from my childhood, the Lego and toy soldiers, for example. I also made some movies using old computers like the Commodore 64, I used the type of graphics of the Commodore. So basically, I still use items and materials of the past in new contexts, modern and contemporary. Silvia Casini: What you say is very interesting because the robots are often associated with innovative materials and technologies in futuristic science fiction scenarios, and you associate them more to childhood, intimate memories and play. Can you comment on this kind of choice? James Johnson-Perkins: Yes, just Gigapan technology, which enables the realization of these collages panoramic pictures. Silvia Casini: Which Venetian landscape or view has triggered your memories in particular? did you get Doctor Who in Italy?. Silvia Casini: I don’t know, I think not! James Johnson-Perkins: So most of the things I use, my inspiration, in fact, come from programs, films, but the thing that interests me is that when you look at these panoramic images as very large images from afar, they seem truly Renaissance paintings, but when you get close to look at them more carefully, little things, details, jump to the eye, emerge from the picture, and many of these things have international allure, like Star Wars. 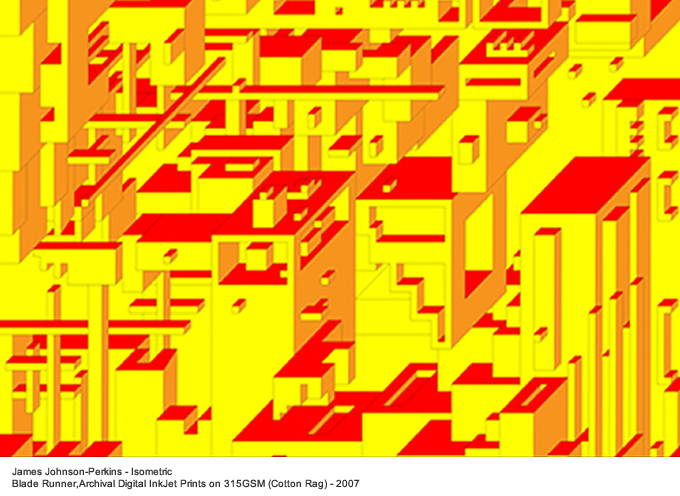 So when you look at the surface of these images, here is the point when memory is reactivated. In the past I also used toys and things that called for the memories of other people than myself. Silvia Casini: It’s interesting that you make associations between the concepts of past/present on one side and distance/near in approaching your work. James Johnson-Perkins: Yes, I think this relates to the idea that a painting of the Renaissance, of five hundred years ago, is both contemporary and a modern image. James Johnson-Perkins: I like to use the latest technology and I like to share the same ideas in different ways. Coming to Venice gave me a great opportunity to have this background on which to place these ideas, for me Venice is inexorably linked with the history of art, I would like to do an artist residency in another country for me to see where it would lead me. Silvia Casini: So you are thinking of using the same technology, Gigapan, in different historical, cultural and geographical contexts? James Johnson-Perkins: Yes. So if I went to Paris or France I could be influenced by some ideas let us say, “impressionistic”, could be influenced by the landscape of the Impressionists, but again, it would put it in a hyper-modern context. Silvia Casini: What other places of Venice you used for your work over the Rialto bridge? James Johnson-Perkins: I used the Scala del Bovolo (the Bovolo Staircase). This was more a collaborative project as I worked with an English artist named Rachael Allen, and making things in miniatures: it is she who made the wheelchair miniature. 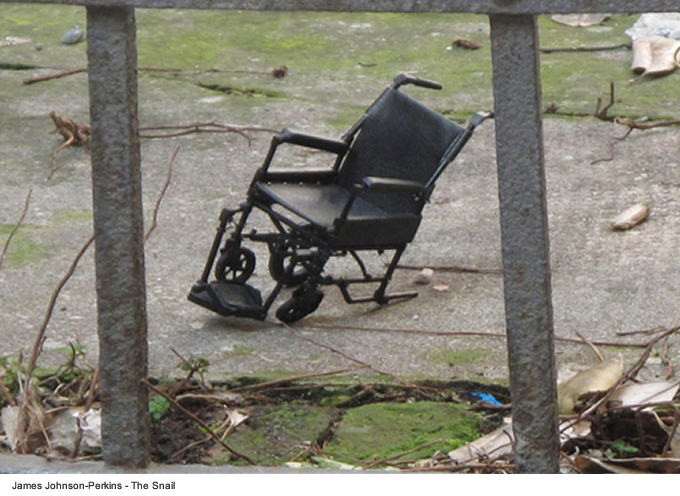 So I would say that the idea behind that project had to do with the relationship of size, scale: a large image, a kind of long shot, a special note in the corner, this tiny wheelchair. 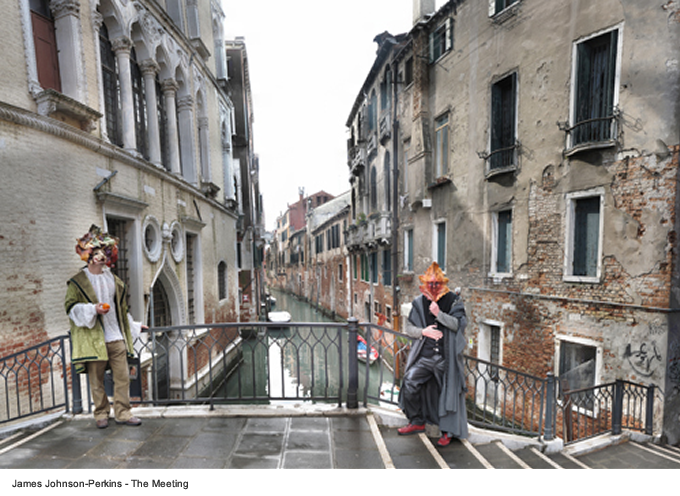 Now I started to use also the people, for example people who are on a bridge: a writer who is also a friend of mine, wearing a Venetian mask, is standing on a bridge near the ghetto. I had another job with some of my friends dancing on the edge of a pier, the image is called The Dancers and it is also set in the Jewish ghetto: in the corner, looking elsewhere, you have these two figures and in the background you can glimpse the industrial area. Here, I began to think about using people who perform actions. Silvia Casini: So there is an element of performance that returns, the same element that is so present in your previous work. James Johnson-Perkins: Yes, and I have used things myself as well. So now the main element is the dynamic of scale because these are big images and you put something very small, an image of a person or a thing which relates to the image or not or maybe it just triggers an idea as in the Rialto bridge. I have also used Marks Square, Batman and posters, then again, I use images as pop icons in different places. James Johnson-Perkins: Yes, I think it works something like this. These dancers are such tiny and you can zoom in. These images are not finished yet, I still need to work on them. However, I like the idea that these images are also a kind of game, a little like ‘how to use Whears Wally’, this little character who must be found in a tangle of events. James Johnson-Perkins: Almost always the primary colours, it is the same for my performances, I like the idea of characters who wear strong, bold colours. This depends of course on my sensitivity Pop: I like things to be bright and bold but, and therein lies the irony, when these same things are seen from a distance, they are not so sure. Silvia Casini: These images ask the viewer to be watched very carefully, not only to be seen, to the point where one realises that there is something hidden in them. I’m starting to use titles to lead in, so it’s the title that is the inside the Rialto bridge image I think I am going to call it “The Great Battle between Good and Evil” so you when you look at the character you need to think about the relationship between them, the Bovolo it’s The Snail because this is what it’s called anyway, so I’m using paretic references as a way to think about the images. In a way yes, but this is the first virtual photographic work I’m working on so… I do not know, I started using titles to lead the viewer into the work: for example, the image of the Rialto bridge I’ll call it “The Great Battle between Good and Evil”, so that when one looks at the characters appearing one needs to think about the relationships between them. In the case of Scala Contarini del Bovolo I called it The Snail because that is how it is commonly named, and then somehow I use references walls as means to think about the images I create. Silvia Casini: We started talking about enjoyment of your work and how you are considering exhibiting. Do you think of putting your pictures using screens, computers or do you prefer your images to be viewed comfortably as materials installed in a physical space? So, do you want to give real substance to your images? James Johnson-Perkins: I think I would like to use both exhibition modes, first of all I have to retouch images, no more than eight or ten. I would first place them in a sort of virtual gallery, and then, later, I would like to put this virtual gallery in a physical space. 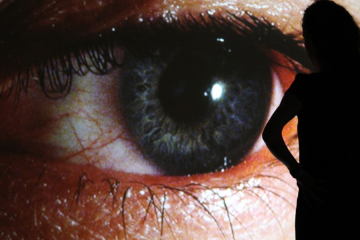 I think of a number of computer terminals available to all, through which visitors can explore the images maybe even projecting them on a giant screen. Thus, despite the virtual dimension, people could navigate the image and project it on the wall. Then I would also like to present these images as large format photographs. The nice thing is that both methods work: one can see these images outside the context of the art gallery, and as virtual images, and this is beautiful. Silvia Casini: You are very much influenced by Pop art and you work with daily-life objects, toys, etc. Which are the criteria that lead you in terms of choosing certain objects and props? James Johnson-Perkins: I like things that are funny or make me laugh or that are visually striking, and things that very much relate to my own memories and life really, but I am not very, there is a concept. Initially, when I start a work is about making something enjoyable, something that has a pop sensibility, it is fun and people can get into, it’s not serious work, I don’t make serious photographs, I mean, I guess the criteria is just to make it accessible I guess. I like objects that are weird or make me laugh or that are visually striking, or things that relate to my life, my memories. When I start working on something it is because I want to create something that can be fun, something that has a pop sensibility, it is fun and people can get into it, I mean that the policy that guides me is to make work accessible to the public. Silvia Casini: Have you considered the possibility of reversing the procedure? That is, use landscapes, scenarios that have been important in your life, landscapes full of personal memories and set up with items randomly selected? James Johnson-Perkins: Strange,the other day I was talking with my artist friend that he is doing a residency here in Venice, we talked about Giorgione, the three ages of man that Giorgione represented: there is child, adult and old. I think at this point in my life I’m still looking for the child, at some point I guess I will start looking at adult and we’ll see where this will take me! One of the things that intrigues me is starting to use slightly more obscure things, so to speak, more to the limit, but because my work has always been very focused on fun and being a bit ‘out of phase so to speak, and maybe then I reach the adult stage … in fact I believe that my work is becoming a bit ‘more serious, that has to do less with my childhood and more with simply looking at things as they are. James Johnson-Perkins:Do you believe? I’m glad you say this, because yes, I would like doing things slightly more edgy, slightly less in control of whether I understand them or not due to a moment of my childhood, my memories. Silvia Casini: Well, this is Pop!! James Johnson-Perkins: Yes, and then Pop art is not always carefree don’t you think? I think of Warhol, the electric chair. An artist friend of mine, I told you before, has done some research on Giorgione and Aldo Minuzio and thus came the idea that these two men have met. 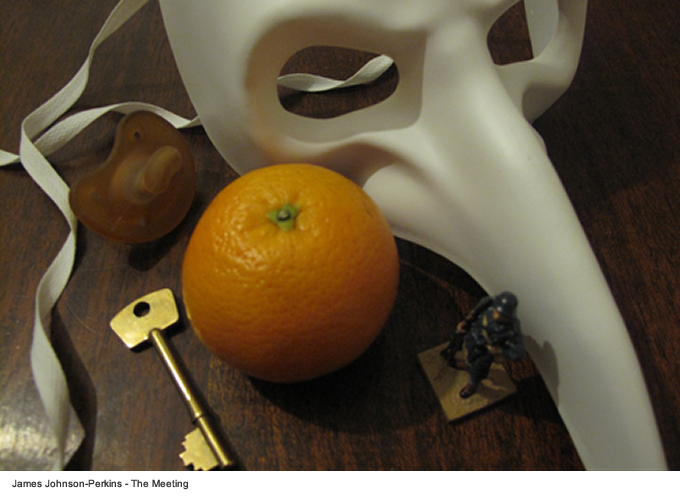 I liked this idea, so I used masks and costumes to represent these people and this meeting. I found it interesting that the idea of disguise is also linked to other work I’ve done before. Silvia Casini: Do you also search and browse files when you are building stories, possible narratives? James Johnson-Perkins: This is really unusual, because I always work very intuitively. But for some objects I think about their place: for example, if I go to Rome I would love the idea of a Gigapan panorama of the Colosseum with my soldiers, so you have modern soldiers and the soldiers of the past, and establish connections. But still, I work intuitively, I think certainly of the history of the place that I use as scenery but I do not start with theory to construct an image, I begin to think especially when I am already in the place and say “where this could go, this is another place where I can go”, and so on. Silvia Casini: How important is the choice of material these objects are made of? Or are you interested in a particular object only for its metaphorical value, for the stories that it may contain in itself and then tell? 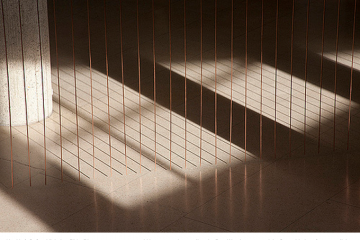 James Johnson-Perkins:You can not avoid metaphors if you make art, and in my case the materials are not important. Curious that you mention this, now that I think, I realise that some materials I use are special, not stereotypical ones, so probably also the type of materials is important in so far as it can reactivate feelings and memories. Many of these items come from my personal history: for example, my father was in the army, he was a soldier, so these things have a very emotional impact on me. Silvia Casini: Some of these objects imply a close relationship with the body. Now that I look at some examples of your selection/collection of things (you’re an artist-collector! ), it is almost always the things you wear (the mask), or things you bring in to be manipulated (the soldiers) and eaten (orange). In short, they are all related to your body and here again there is the element of performance. 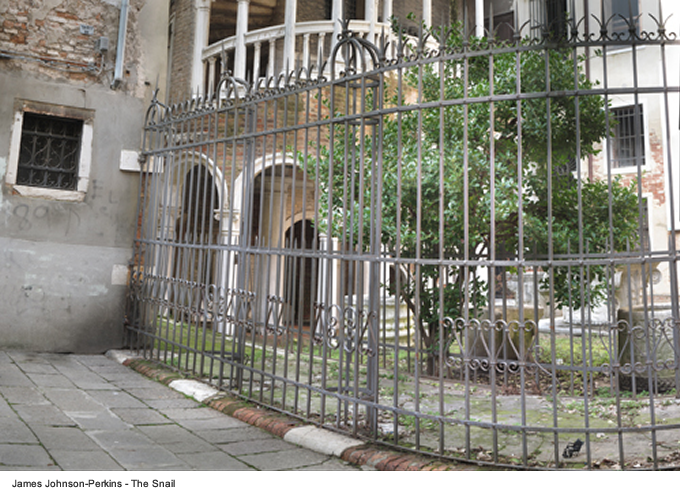 My last question concerns the residence in Venice as an artist. Of course, this was a great opportunity for you, but what remains in Venice of your time spent here? James Johnson-Perkins: I would love to show my work here, but since the Emily Harvey Foundation does not have a gallery in Venice (but in New York) I do not. In a way, I am glad I have more time to work on the images I created to make them the best. I would like to return here sometime and exhibit the work possibly confronting it with other work done. Silvia Casini: What are your plans after Venice? James Johnson-Perkins: Si! Yes, possibly! You have to be! !